Know what stage your horse is at. To select the best horse feed, you should factor in their breed, age, weight and physiological stage of your horse (whether it’s breeding or non-breeding, pregnant etc.) Generally speaking, horses aged 2 or less, senior or sensitive horses require different nutrients, which may require you to choose different products. 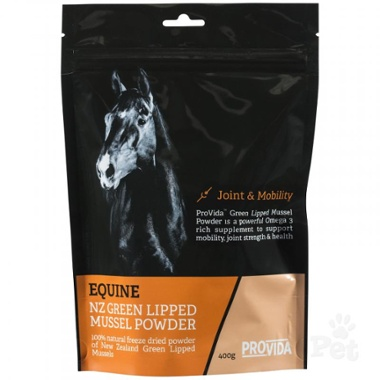 Or ageing horses may require a joint supplement to help them stay flexible and comfortable like ProVida Green Lipped Mussel Powder. Horses who are grazing on good pasture don’t usually require much hay, but sometimes there just won’t be enough pasture, whether from drought, winter or other reasons. When this is the case, aim to supplement their diet with plenty of good quality hay. Many owners prefer to give their horses a mixture of grass and legume hay for nutritional balance. For best results, check with your vet or equine nutritionist about the specific needs of your horse. 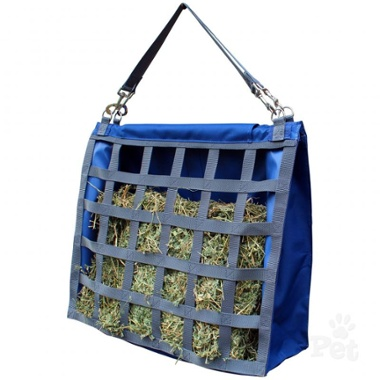 When feeding hay it is good to use a slow feeder bag like the Caribu Slow Feeder Hay Bag as this is an easy way to deliver feed over an extended period of time while preventing your horse from gorging or rushing their feed. Give them small amounts and often. Horses have digestive systems built to graze and browse for at least twelve hours a day, so it’s better to give them small, frequent meals especially if you’re feeding them grain or concentrates. Large meals can overwhelm the digestive capacity of their small intestine, and infrequent feedings can lead to problems like gastric ulcers. In addition to this, make sure that they have constant access to any essential forage that should form the bulk of their diet. When feeding your horse hay or concentrates, measure the quantities by weight and not volume. To calculate how much your horse should consume each day, find out how much they weigh. Horses are able to consume about 1.5% -2% of their body weight each day in dry feed. Most hay is issued in flakes/bales, but while the flakes may look similarly sized they can actually vary greatly in weight, so it’s better that you weigh their hay to check first and stick to that serving size. Provide adequate water and salt. It’s essential that you provide plenty of clean water for your horse, particularly if they tend to eat more hay. Poor hydration can lead to conditions like impaction colic (which is a material obstruction in the large colon). Horses normally consume between 20-55 litres of water in a 24 hour period though this may vary for some. Always check your water troughs at least once a day to ensure that an adequate supply of water is available at all times. In addition to this, help them maintain electrolyte balance with a salt block or sprinkling some loose salt in the pasture. The best nutrition for your horse comes from good quality pasture or hay. Things like drought, weeds (some of which are toxic to your horse), mud and over-grazing can compromise the quality of your grass and therefore your horse’s diet. Always inspect your pastures, reseed bare spots and keep it fertilised to encourage strong grass and continued growth. Horses are creatures of habit, even in the wild. Having a solid daily routine can help them keep calm, secure (even if they’re not explicitly showing signs of anxiety). In addition, keeping your horse on a consistent feeding schedule means they’ll be less likely to experience an upset digestion or other sensitivities. Although usually good quality feed and hay is enough to keep a horse healthy. Every horse is different and some supplements may be needed to keep them looking at feeling at their best. One common complaint of horse owners is that they want their horse to have a shiny coat. In this case you often need to provide s feeding extra fat, this can be one through adding an essential fatty acid to their diet, that can have a positive effect on their coat. 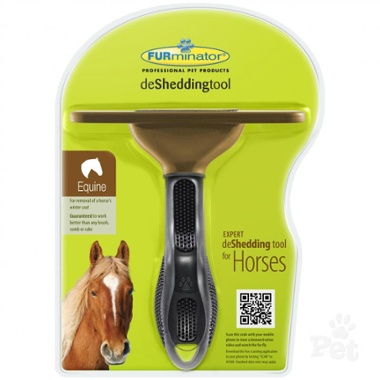 Although the key to coat health is still regular brushing with a brush like the FURminator Deshedding Tool as this helps to remove loose hair and bring out the natural oils in their coat. Do you have other guidelines when it comes to feeding your horse? Let us know in the comments!